Just got back from the vet who confirmed that my GCC's recent vomiting, temporary anorexia + drinking excess water and poop blockage problem, as well as the long-term yeast colonisation of her crop, was, as I suspected, due to FIBRE INGESTION. Most of what you hear about fabric/rope toys being unsafe relates to fraying/entanglement, which is why you'll still see supreme cotton and fleece being sold as 'safe'. Unfortunately, parrot stores for some reason completely ignore the ingestion side of things - where the tiny fibres cause a blockage in the digestive tract and can well lead to the death of the bird. Our vet told us that most of the time, this is diagnosed as the cause of the issue only on autopsy, because the bird can be ok while the fibres are building up, then death can come swiftly once the blockage is complete! Even if you don't think your bird is chewing on something, be careful. I've never seen Shark chew on her rope perch, it's barely fluffed up just from her walking on it for a year - and yet today the vet found colourful fibres in her crop. This is the only colourful fibre product she has access to, so it's a no-brainer - the rope boing will have to go! The veterinary profession knows this is a problem, just like zinc and split metal on toys, so why is it listed nowhere else that I've seen? I would personally consider any toy manufacturer claiming that a rope or fabric toy is 'safe' to be either negligent or misleading. Thats scary, thanks for the info. I don't allow rope in the birds cages but Ollie does have a happy hut. hows your little GC now? She's fine, she was feeling off for not much more than 18 hours (and she was asleep for most of that). The most worrying part was really that this happened Thursday evening, and the vet was closed for 4 days straight over Easter (when normally the only day they close is Sunday - damn you, religious holidays ). Since I rotate the rope perch out relatively often, there wasn't much fibre buildup, so we're focusing on taking out the yeast with antifungals (again), and then we'll try apple cider vinegar in the water to keep it away. Poor thing but I'm so glad you caught it in time, keep us updated wont you. Wow, what a scary story, I'm so glad Shark is okay! My GCC has one rope perch and a Happy Hut that he sleeps in but I examine both regularly and neither shows any signs of being chewed on. However, after hearing that your rope perch also didn't appear to be chewed on I may remove the rope perch from the cage. I don't think I could take away his Happy Hut, though, because that's where he sleeps and even in his first home that was where he slept so he's been sleeping in one for at least 6 years (and maybe even his whole life if he had one in the pet store). You could try making him a safe happy hut using a seagrass mat or some similar woven plant, and weave paper towels into it which he can preen and fluff up. You could even use vegetable dyes to make it the same colour as the current one. Shark likes sleeping on the floor of her cage, and gets upset if there's nothing to use as a blanket so now I use her carrier as the sleeping cage and fill it with paper towel/chewed up paper bags (left over from foraging)/pieces of unused printer paper. I'm sure she'd prefer unsafe cuddly fleece too, but she snuggles under all the paper and I normally can't even tell where she is when I uncover her. And no more angry bird mutterings in the night. Crap! I have a rope perch and a rope swing in Marvin's cage. The rope swing has a bit of a tassle on it. Out, out, out. Thank you SO MUCH for posting about this. I hope your baby is okay. For a new "hut", you might want to get a woven grass rodent hut and suspend it from the cagetop. I did that for my cockatiel because he chewed up the edges of his Happy Hut, and he really liked his new set-up. I just lined it with shredded paper towel. My poor little bird 'Match' was found dead at the bottom of his cage yesterday morning. I was so heart broken and this honestly came as a complete shock to me. It was later discovered from the autopsy results my poor little bird had an intestinal obstruction from the cotton rope perches he had in his cage for the last 3 years. (a total of 3 cotton rope perches inside his cage). It is now obvious looking back that this material must have built up in his stomach over time which sadly resulted to his prompt and very sudden death. 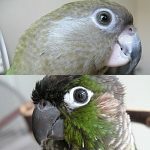 I would advise to everyone out there - do NOT buy any perches that contain fabric or loose threads and do not hang towels or blankets over any cage at night that contain loose threads or cotton. My little bird’s death could have been "completely prevented" had I known these dangers. Match seemed very happy right up until his death he would often whistle and ask me “What ya doing” and sing his favourite song “Jingle bells” and “Pop goes the weasel”. At the time I had no idea how serious his condition was however looking back I did notice very small and subtle changes. My bird on occasion would try regurgitate - but I just put this down to normal bird behaviour. I also noticed a drop in his weight so I introduced Lorikeet formula as an additional supplement to his seed. Match shared his cage with another cockatiel so I assumed he was eating both the bird seed and the lorikeet powder because I was replacing this every 3 days. I was told by the vet that the powder would have been keeping him alive, this was probably the only thing he could absorb because the few seeds he would ingest could not being digested because of the blockage he had. i think every bird person has a rope or string of some sort. honestly we just have to be better at observing if they are digesting it or not. If we start taking those out then we might as well give them no toys at all of any sort since there are dangers with anything they play with.